Alpine Electronics of America, Inc. is now shipping two new Restyle weather-resistant JK head units for the Jeep Wrangler. 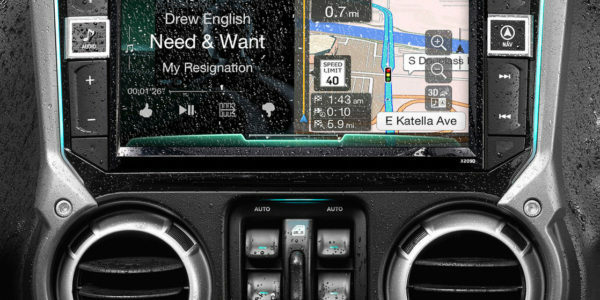 The i209-WRA and X209-WRA have 9-inch touch screens and are the first aftermarket Wrangler systems equipped with weather resistant features along with Apple CarPlay and Android Auto connectivity. The X209-WRA and i209-WRA Restyle systems are Alpine engineered for the 2011-2017 Jeep Wrangler. 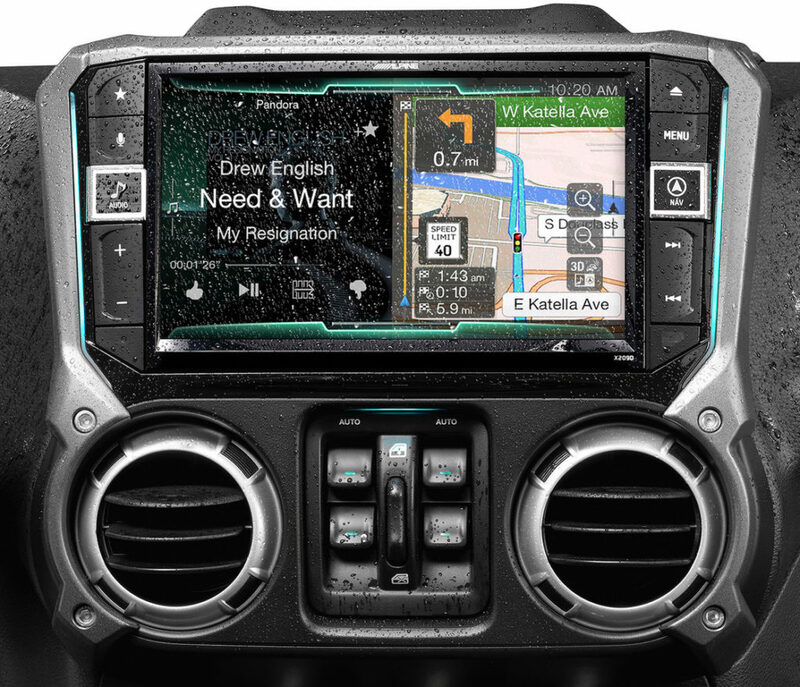 These models are Alpine’s third generation Restyle systems for the Wrangler, and they feature a 9-inch capacitive touchscreen with a 4-way swipe control Graphical User Interface (GUI). The screen is framed with an aggressively-styled dash bezel fitted for the Wrangler. The systems come with Wrangler-specific wiring harnesses for plug-and-play installation. The X209-WRA is an AM/FM/CD/DVD system with an embedded navigation system. It was a winner of the 2017 CES Innovations award, recognized for outstanding design and engineering in the In-Vehicle Audio/Video category. The i209-WRA has the same basic feature set, but without a CD/DVD slot or embedded navigation system. Part of the fun of owning a Wrangler is to use it for exploring, but Mother Nature can put a damper on those plans when driving with the Wrangler’s top off. The X209-WRA and i209-WRA can keep up with the adventures even when they’re exposed to dirt, dust and light rain. The 9-inch touchscreen and bezel are rated at IP53 for protection against dust with limited ingress and fresh water spray up to 60° vertical, so the journey can go on uninterrupted. The X209-WRA and i209-WRA are compatible with Apple CarPlay and Android Auto. Both models “Work with Apple CarPlay” and let iPhone users make and receive calls, access text messages, play music, and get directions in a way that allows them to stay focused on the road. Apple CarPlay is accessed through the capacitive touch screen or the “Voice” hard button to activate Siri voice control and is compatible with iPhone 5 and later (iPhone must be connected via Apple lightning cable). The X209-WRA and i209-WRA are also Android Auto Compatible. Android Auto was designed with safety in mind. With larger touch targets, a simplified interface, and easy-to-use voice actions, it’s designed to minimize distraction so drivers can stay focused on the road (requires both a USB cable and Bluetooth connection; requires an Android™ phone running 5.0 [Lollipop] or higher and the Android Auto app). Android Auto is accessed through the touch screen or the “Voice” hard button with voice control. The X209-WRA is a match for drivers who prefer an embedded navigation system. When used off the beaten path where cellular service and smartphone maps are not accessible, the X209-WRA’s embedded navigation will continue to operate with route guidance. When used in major metropolitan areas, the navigation system is supplemented with free lifetime RDS traffic monitoring from HERE®. In contrast, the i209-WRA is suited for drivers who are comfortable with smartphone maps and don’t need an embedded navigation system. · Video entertainment: Built-in DVD player on the X209-WRA, or optional add-on DVD player for the i209-WRA (DVE-5300, sold separately). Another HDMI input can be added to either system via the KCX-630HD HDMI Selector Interface (sold separately). · iDatalink® Maestro® module: The included module retains select Wrangler controls (like the voice activated media player, voice activated Bluetooth® wireless technology, steering wheel controls, premium audio amplifier integration and visual parking assistance) and displays select vehicle information (like tire pressure, battery voltage, door status, engine codes and user customizable gauges). · “My Favorites” feature allows for customized quick-access screens with shortcuts to the most-used features. · The X209-WRA includes Airbiquity® technology which uses the companion Alpine Connect smartphone app to access content from apps like Alpine Go! for collecting desired destinations for future visits, iHeartRadio®, Yelp®and Glympse®. The X209-WRA and i209-WRA can control other Wrangler accessories for system expansion. When used with the optional KAC-001 External Accessory Control Module (sold separately), each model provides touch screen control of up to eight accessories like a light bar, winch, headlights, etc. A graphical icon and text label can be assigned to each accessory for on-screen identification. Each accessory can be configured for a pulsed, latched or momentary output. When a rear view camera is added to the X209-WRA or i209-WRA, a parking guide overlay is automatically added to the rear image on the touchscreen. If the Wrangler has multiple camera systems, they can be controlled with the KCX-C250MC Multi-Camera Selector Interface (sold separately) which allows up to three camera systems to be controlled from the screen for one-touch viewing of the camera images. The X209-WRA (SRI $4,000) and i209-WRA (SRI $2,200) are available now, visit www.alpine-usa.com for a store locator.